This recipe is inspired by one of our favorite chefs, J. Kenji Lopez-Alt, but differs by our way making Chicken Meatballs instead of beef meatballs. You should know, however, I am a huge fan of all meatballs, no matter the shape, no matter the meat, no matter the seasonings, so I was extremely excited to make these. My favorite part is mixing all the ingredients with your hands and forming the balls. My preferred method of cooking any meatball is definitely the oven! A slow oven cooked meatball beats cooking them in a skillet, where there is risk of over cooking or undercooking the meat, any day. 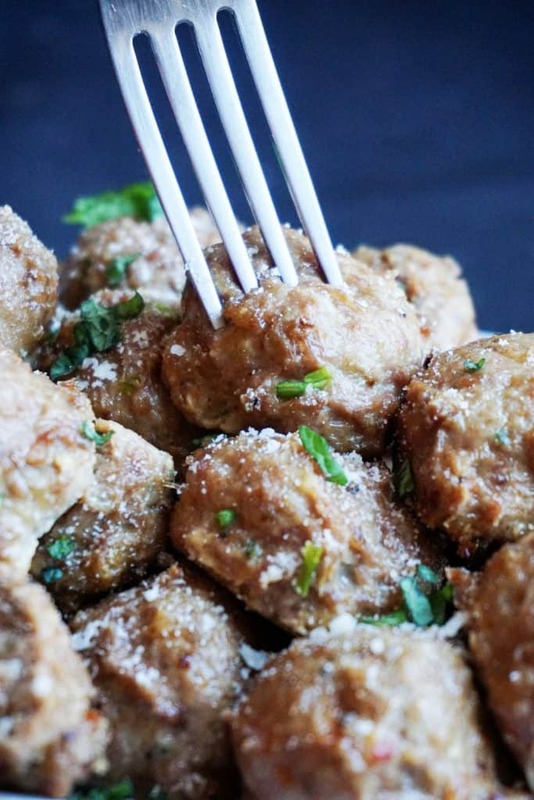 Oven baked chicken meatballs are guaranteed to be juicer than any other method of cooking them! There is almost nothing worse then a dried out meatball hidden under a sauce. These are so good you don't even need a sauce for them. What makes these ground chicken meatballs the best is the ingredients I used. A little bit of everything goes a long way in terms of flavor! The soy sauce is a secret weapon that should always be turned to when cooking meats. And, with the grated parmesan and egg to help bind the meat, bread crumbs aren't even necessary! When it comes to spices you can any way you want to be honest, but what we've provided you below is a perfectly well balanced equation for juicy low carb chicken meatballs. You can without a doubt replace the ground chicken in this recipe with beef, lamb or pork. It's entirely up to you! Maybe a mix of pork and beef for a fattier, juicer meatball?! If you like this recipe you are sure to love our Keto Popcorn Chicken and Easy Cashew Chicken recipes. Although we normally use chicken thighs for a higher fat content, in our Low Carb Chicken Meatballs recipe we used ground chicken so feel free to up the fat in other ways! 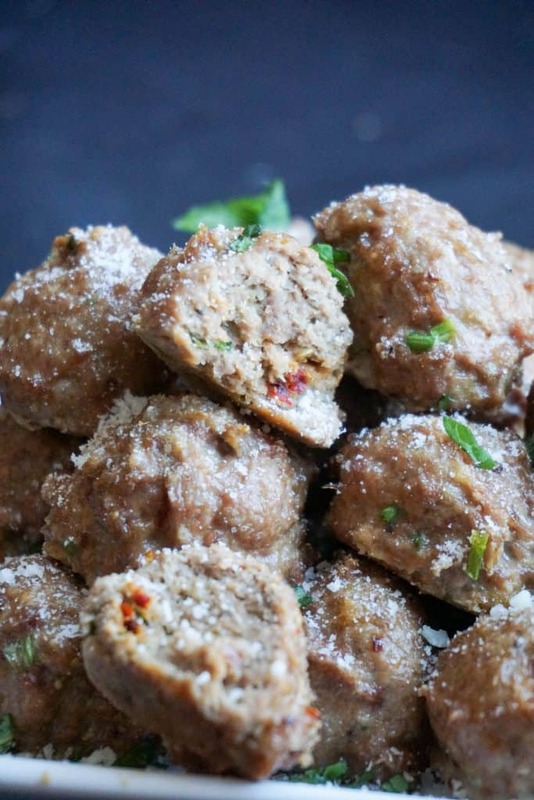 Recipe can be quickly added to MyFitnessPal - Search "KetoConnect - Chicken Meatballs"
Place ground chicken in a large bowl. Add all the seasonings, egg, cheese, soy sauce, chives, and heavy whipping cream to the chicken and combine using your hand. Preheat the oven to 350 degree and let the ground chicken mixture rest for 15 minutes in the bowl. 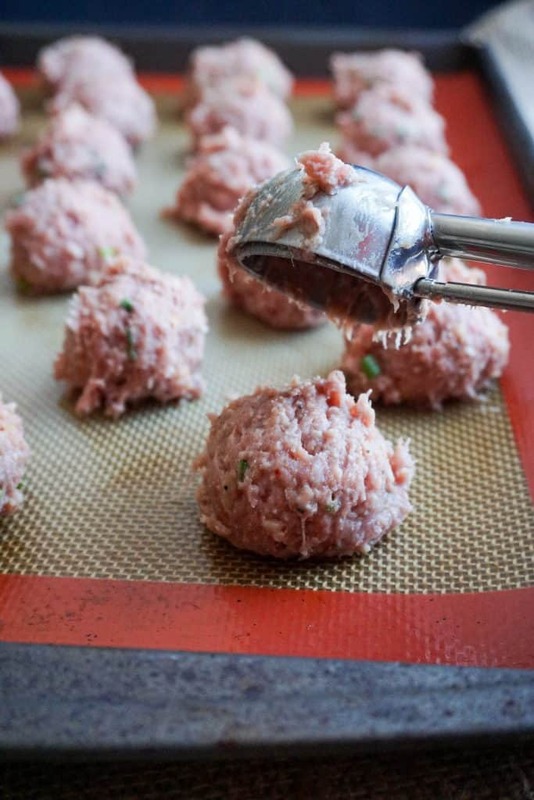 Using a cookie scooper or your hands form 1 inch meatballs. Place meatballs on a greased baking sheet and bake at 350 for 25 minutes.